Presence of coronary to pulmonary artery fistula is generally a feature of pulmonary atresia with ventricular septal defect. We present a rare case of left anterior descending coronary artery to pulmonary artery fistula in a patient of tetralogy of Fallot. A 10-year-old male child presented with complaints of cyanosis since age of 1 year and currently with New York Heart Association (NYHA) class II dyspnea on exertion. He had no history of cyanotic spells. On examination he was averagely built with central cyanosis and grade 2 clubbing. His pulse rate was 90 per minute with blood pressure of 110/76 mmHg. The cardiovascular system examination revealed normal S1, single S2 and continuous murmur best heard in third parasternal area in left intercostal space. The baseline arterial oxygen saturation was 85%. Chest roentgenogram showed decreased pulmonary blood flow with right ventricular type of apex, presence of pulmonary bay and large aorta. Electrocardiogram revealed normal sinus rhythm with features of right ventricular hypertrophy and right axis deviation. There was no evidence of myocardial ischemia. The transthoracic echocardiography showed large subaortic ventricular septal defect (VSD) with 60% aortic override, right ventricular hypertrophy with severe infundibular and pulmonary valve stenosis. Catheterization and angiography study confirmed diagnosis of tetralogy of Fallot (TOF) with large VSD, right ventricular hypertrophy and aortic override. There was only trickle of flow to the pulmonary artery in right ventricular injection. The aortic root injection showed presence of large communication from left coronary system opacifying pulmonary trunk. 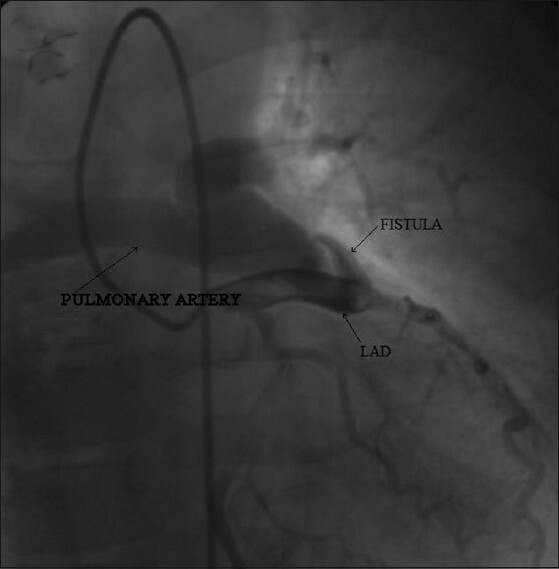 Selective coronary angiogram confirmed presence of fistulous communication arising from left anterior descending (LAD) coronary artery opacifying the main pulmonary artery [Figure 1]. At surgery the fistulous communication was ligated and intracardiac repair performed with Dacron patch VSD closure, infundibular resection, pulmonary valvotomy and right ventricular outflow tract augmentation using autologous glutaraldehyde treated pericardial patch. The patient had an uneventful recovery and discharged on day 10. The surgical importance of coronary artery fistula to pulmonary artery lies in the fact that the communication needs to be identified and ligated before commencing cardiopulmonary bypass to prevent loss of volume to pulmonary vascular bed. In case of failure to close such communication prior to application of aortic cross clamp there will be loss of cardioplegia solution to pulmonary circulation and incomplete myocadial protection during administration of cardioplegia. Physiologically such communications in TOF helps in increasing pulmonary blood flow and reduction in degree of cyanosis. In our case the infundibular stenosis was so severe so as only to allow hegar dilator of size 3 with difficulty, yet the saturation was 85%. Other importance of major coronary artery to pulmonary artery fistula could be myocardial ischemia, though not present in our case. The identification of such communication is important by preoperative investigations so cineangiography, computed tomography angiography or magnetic resonance angiography is necessary in each patient of TOF especially when echocardiography reveals severe infundibular stenosis but the patient is not so blue. 1. Lowe JE, Louis JD, Sabiston DC. Congenital lesions of the coronary circulation. In: Sabiston DC Jr, Lyerly HK, editors. Textbook of surgery: The Biological Basis of Modern Surgical practice. 15 th ed. Philadelphia, PA: Saunders; 1997. p. 2124-35. 2. Amin Z, McEllinney DB, Reddy VM, Moore P, Henley FL, Teitel DF. Coronary to pulmonary artery collateral in patients with pulmonary atresia and ventricular septal defect. Ann Thorac Surg 2000;70:119-23. 3. Dabizzi RP, Caprioli G, Aiazzi L, Castelli C, Baldrighi G, Parenzan L, et al. Distribution and anomalies of coronary arteries in tetralogy of fallot. Circulation 1980;61:95-102. 4. Talwar S, Sharma P, Gulati GS, Kothari SS, Choudhary SK. Tetralogy of Fallot with Coronary Artery to Pulmonary Artery Fistula and Unusual Coronary Pattern: Missed Diagnosis. J Card Surg 2009;24:752-5. 5. Agarwal S, Mishra BB, Mukherjee K, Satsangi DK. Coronary-to-pulmonary artery collateral in tetralogy of Fallot. Asian Cardiovasc Thorac Ann 2009;17:304-6.